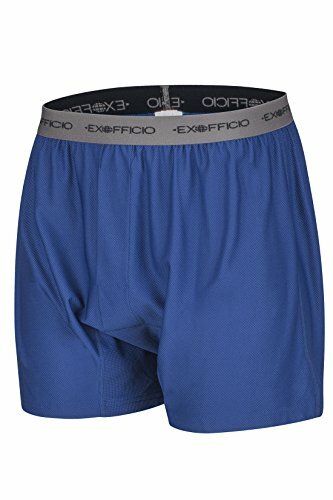 ExOfficio Men's Give-N-Go Boxer,Admiral/Grey,Medium | What Should I Say? Travel fresh and stay dry with ExOfficio Men's Give-N-Go Boxer Shorts. This breathable underwear wicks away moisture, keeping you dry and comfortable. The quick-drying fabric can be washed in the sink or the laundry and is ready to go on your next adventure within hours. Odor-resistant technology leaves you (and your boxers) feeling fresher longer, a key feature on multi-day trips. The comfortable waistband stretches to fit and retains its shape.